Why a game of taking photos? Like everything in life, how you are introduced to something will carry on through your years. Photography and how you take portraits are no different. Feeling more confident with taking photos and establishing a better comfort level when a camera is out becomes invaluable to the self-esteem and well being of children, tweens and teenagers. It has been said that "it is a paradox that those that are closest to us are the ones we sometimes fail to photograph enough." The SnapShotz Photography Board Game provides a venue for experimentation and discovery of how you take and look in portraits. It brings a board game's ability to draw people in around a table and create a fun atmosphere. The perfect excuse to take photos together. Use your digital camera, smart phone or tablet and bring out your favorite Photo Booth Props. You can raid your closets, attics or buy some props at party and costume stores like Party City. 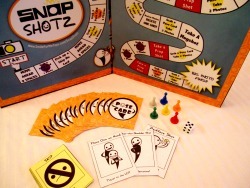 The game of SnapShotz uses "PoseCards" (18 in the deck) that get drawn when a player lands on a "Grab a PoseCard" space on the board. They are cards that show a pose that players can take while sitting at a table. Some are silly and trendy, some are classic and more serious. The game is designed so that all ranges of personalities will love to play. People that take a ton of photos and "selfies" will love the structure and the challenges that the game provides. People that tend not to play board games and might be a bit "photo allergic" or camera shy may get the excuse they have been secretly waiting for to experiment a bit with a new camera phone. The youngest in the group can't wait to try out the photography props you have picked out. The tween finally gets to show off his or her new smart phone or tablet camera. The older relatives love the attention and find it a perfect reason to get close in and take some photos that they normally would not get. No stale or overused trivia cards to get bored with, no anxiety over rushes for answers with a timer, no pressures to perform by yourself in front of others to be judged, everyone pulls together in a common purpose. Having fun together taking photos. You can always hit DELETE. (Parts of the game allow for some deletions of the photos in the game). Learn more on our home page button named "SnapShotz Game" and order a game from the "Add to Cart" button or click here at the SnapShotz Photography Board Game where you can make a game of taking photos. Reunions, birthday parties and game nights are great places to take SnapShotz!